When your body is dehydrated and fatigued by heat, the last thing you want is to overload your system with a heavy meal, which could make you feel more sluggish and generate even more warmth. Instead, chow on smaller bites through the day. And be sure to also drink plenty of fluids every hour. By affecting your salt and water balance, a surprising number of common medications could increase your risk of getting heatstroke. These include blood pressure medication, antihistamines, antidepressants and sedatives. If the temperature is on the rise, ask your doctor about your medication and other tips to prevent heatstroke. Even though you're not under the sun, heat can quickly build up in a poorly ventilated space like a stationary car, gym or room, speeding up dehydration. The poor oxygenation can also make you feel worse and induce nausea. 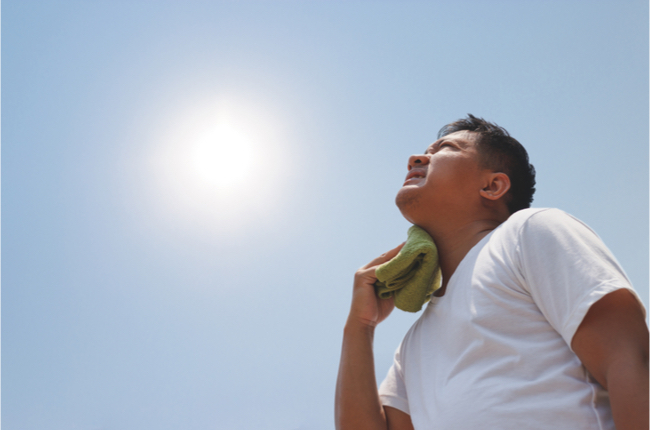 If you feel too warm, avoid potential heatstroke by turning on the air-conditioning or fan, taking showers, opening the windows and wearing loose, breathable clothes. Anything too sugary, alcoholic or caffeinated can make you lose water more quickly. Good hydration is key to preventing heatstroke by helping your body regulate its temperature. Drinking plain water is the best option, but sports drinks (without caffeine) can also help replenish lost electrolytes and minerals like sodium and potassium. While you're out and about, watch out for inconspicuous sources of radiant heat that could tip you into overheating territory. These heat sources include bright, sandy beaches, bouncy castles, cars in a carpark, machinery, hot buildings, a lit BBQ pit and even wide stretches of road with no shade. Besides having to jostle amid other sweaty bodies who are also exuding heat, being in a crowded area can make it hard for you to make your way out of the crowd if you're feeling the fast-acting effects of heatstroke. If you're feeling dizzy, turning red or have a headache coming on, quickly make your way into the shade and seek out first-aid staff. When it's hot outside, even your regular warm-ups can feel strenuous and put extra stress on your body, triggering cramps, rapid heartbeat and poor balance. In some cases, heatstroke could even be fatal.